Mr. President, Just Do It! President Trump fights resolutely to solve the illegal immigration problem in this country. Unfortunately, he has political opposition that has little concern for real solutions to the issue as they mouth platitudes about their commitment to border security with “high tech devices.” Trump tried a government shutdown fruitlessly. He agreed to a short-term financing of the government telling us he could shut down the government again or declare a national emergency. President Trump, realize you are not going to get agreement to build a wall. Just Do It. President Trump has focused on this issue more than any president since Ronald Reagan. Our national elected officials have used both sides of the issue as a political football (no pun here in light of Super Bowl Sunday) with little interest in a resolution. Democrats just demagogue this matter as if a surge of people coming to our border coached by either coyotes or sympathetic lawyers are of no matter. They tell us they are refugees of some form when they are principally just economic migrants. They tell us Trump is only trying to fulfill a campaign pledge as they create another wildly inaccurate mantra. No, border security is not just a campaign pledge, unless you are a supporter of open borders. Then the talking heads lie to us again. Trump invokes the fact that he can declare a national emergency which is supported by legal scholars. The talking heads go on television to make us believe that a national emergency declaration by Trump would be something extraordinary. Even squishy Republicans state they don’t want him to do it because that would give the next president a platform to declare an emergency. I even fell for that. Until I researched the facts. A national emergency declaration by a president is a fairly routine action. Many have been declared during war time with a few infamous ones like Lincoln suspending habeas corpus in 1861 or FDR interning the Japanese (an executive order, yet akin to a national emergency) or Truman’s seizing control of the steel mills because of a strike during the Korean War. Certainly not all national emergencies involve wartime acts and the rules have changed significantly in the post -Nixon era. The National Emergencies Act of 1976 was passed and signed into law by President Ford. It doesn’t restrict the president very much from invoking these powers, but it does require the Congress to review the declaration every six months. Congress can end the order if both houses pass a resolution to do such. The Federal Register currently lists 31 national emergencies that are still ongoing. That is of the 58 emergencies declared since 1976. They are not rare when they average more than one a year. Of the ones still in place the oldest goes back to the 1979 hostage taking in Iran. Six go back to the Clinton presidency. Ten were invoked by President Obama that are still in place. President Trump still has three in place that he signed on to. The major difference this time is this one would be declared by Donald J. Trump with the Democrats controlling the House. That is the only reason this one is a big deal. It appears the opposition is because of their dislike for Trump and it is out of spite. Why does Trump need to declare a national emergency? Some say because he is going to be spending money. Baloney. President Obama spent billions paying subsidies to insurance companies to salvage his signature legislation, Obamacare. Those subsidies were ruled illegal by a federal judge, but that did not stop Obama from finding the money which Congress said it did not appropriate. Where did that money come from? It has been said that the Congressional Budget Office has already identified where Trump can get the funds appropriated from with his presidential powers. There is a theory that Trump doing this on his own may be just the action necessary to move the country forward on comprehensive immigration legislation. Trump has proposed many facets needed already, such as more judges, more border agents and other matters to improve our situation. A resolution of the DACA participants granted their current status by an illegal (that is what Obama said) executive order could be thrown into the mix. The Republicans will not move on immigration reform without first obtaining border security because they have been promised that previously and it never materialized. The Republicans would be freer to act on such things as visa control, e-verify and others matters previously mentioned without having to worry about a backlash from their base for not securing our borders. Mr. Trump, taking matters into your own hands would alleviate a 32-year stalemate, thus allowing our country to enact comprehensive reforms on the other matters. 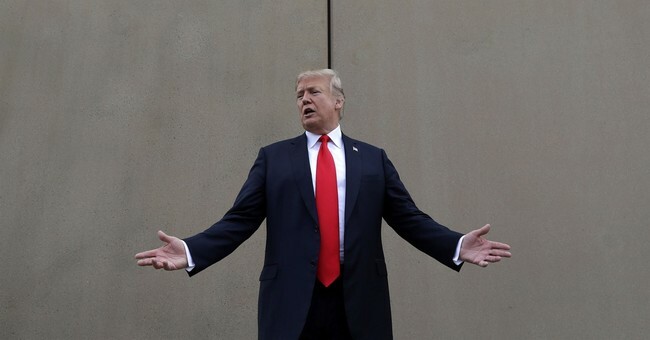 Mr. President, everything points to the fact that this border protection is necessary, the political opposition is intransigent despite a clear threat to our sovereignty, and you have the means and the law behind you to end this chaos. Mr. President, Just Do It!